R2009, Patrick O'Connor. 36", M. Salmon self. 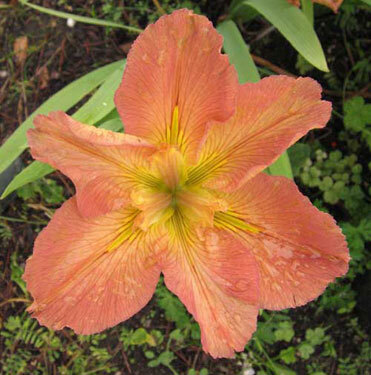 Loosely defined yellow signal area on all petals, with darker salmon veining especially on falls and becoming olive green near center; falls have greenish spear signal in center. Styles salmon in center edged greenish yellow. Flower form flat to slightly cupped. Frenchmen Street x Kelley's Choice.